When tomahawk wielding robbers stormed Ram Sharma's dairy, the father of one had two instinctive thoughts. Fight back or step back. So the Hamilton man, and his parents, took on the thieves using a bottle of soy sauce and canned goods to thwart the pair's violent attempt to grab cigarettes. "Once they come in you can't think what to do. It's only 45 seconds - you can try to protect yourself or you try to stop them." 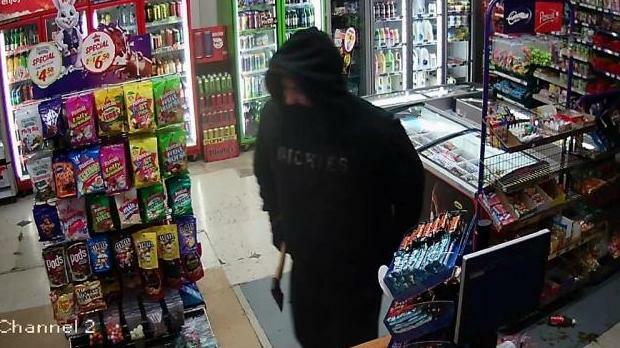 Police are now appealing to the public to help track down the pair who attempted to rob the dairy on Aberdeen Dr and Courtney Ave on Sunday evening. 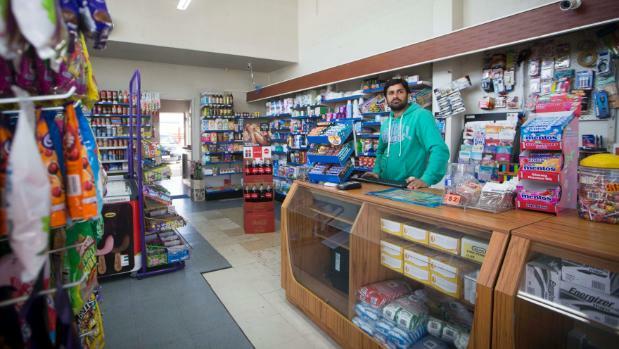 Around 6pm Sharma was working the counter when the two men wearing black balaclavas rushed into the store. They approached the counter with their tomahawks raised and demanded cigarettes. "I was standing out the back in the storage area having a chat with my parents while they were doing some stuff when two guys came in with the axe. As the pair approached, Sharma yelled "hey, don't touch". "I said - 'don't hurt us, take what you want'." "But he still kept coming towards me." Sharma put his hands in the air, repeatedly telling the culprits to take what they wanted. "He said to the other guy - get the smokes." But before the thieves made it to the cigarette cabinet, Sharma grabbed one of the men's axe. "Then he started struggling with me. Meanwhile my dad was pushing him outwards while mum tried to hit him." Sharma's 53-year-old mother turned to the other robber, pulling on the man's mask as he advanced towards the struggling trio. "I think he lost his shoe, which we didn't realise until later." A metre or two away Sharma and the thief grappled with the axe. "Then he started trying to release the axe that I'm holding very tightly." "Then he just took it, tried to hit me again but luckily I had a soy sauce bottle next to me." After the soy sauce, Sharma began hurling cans. "We tried to chase them out but it's too dark outside, there's no street lights and you can't see if they are hiding, and it's not safe to chase them." At the same time the culprits entered the store Sharma believes a customer pulled up outside with a baby in the back of her car. Too afraid to enter the woman stayed in the vehicle and called police. "Once we came back we found one left his shoe behind. We hope the cops can find something." He described one man as being about 5ft 10, of heavy build and darker skin. The other was shorter about 5ft 4 and skinny with white skin. Sharma was taken to hospital on the night with a gash to his finger and rapid heart rate. In the six years the family have owned the store this is the first serious robbery they have experienced. "It does make you think about safety, everyone is concerned about each other. "The mental stress is the main thing, it creates fear and makes you think whether it was safe to run the shop." Sharma was thankful his wife and nine-month-old baby were away overseas at the time. "We just thank god we are safe." Waikato police Detective Sergeant Nicola Cornes said the pair fled empty handed. "This type of threatening behaviour is not something the community should tolerate. "Police are investigating and are appealing to the public for assistance." Anyone who recognises people in the images, or witnessed any suspicious activity around the superette on Sunday, is asked to contact Hamilton police station on 07 858 6200. Alternatively, information can be shared anonymously with Crimestoppers on 0800 555 111.